To push its JetBlue Card—and hopefully drive some impulse trip planning—JetBlue created a digital billboard that tells people standing in Times Square how quickly they can get to nicer climes, right from where they're standing. 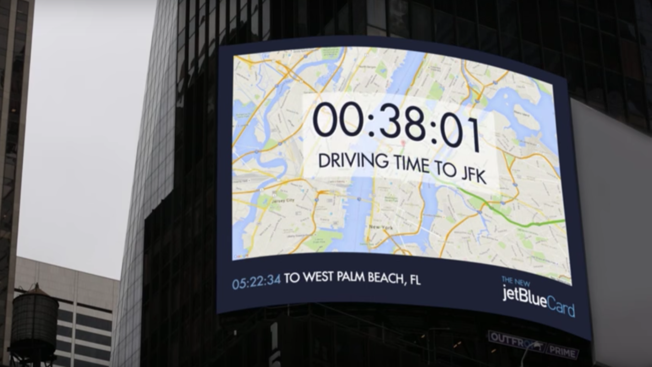 The Android-based billboard, created with OutFront Media, uses the Google Maps API and JetBlue's active flight schedule to produce driving and flight data in real time. Whenever people see a special hashtag, the first person to tweet it with the JetBlue Twitter handle can score a voucher for a round-trip flight. In addition to generating engagement, this is a strategy that could serve to unblock whatever it is in our minds that's constantly telling us we don't have time for a quick, relaxing jaunt. Manhattanites could probably use the reminder more than anybody. Just think: In half a working day, you could be in West Palm Beach! Gotta say, we're up for any card that lets us eat lobster right out of bed. And if we can pop over to Florida right after, why not?